As I child I connected deeply with my dog, and the neighbors dogs, and my uncles dogs and my grandfathers and on and on… I also connected with the romance of a wild life. My play and drawings were often of Native Americans, mountain men, horses and wolves. Especially wolves. In 5 grade, at the book fair, while I image other kids bought books on skateboarding or ponies, I borrowed the final 10 cents from one of the teachers to get Jack London’s White Fang and Call of the Wild. In highschool I made a life size paper mache wolf for an art class project. Obsession is a word one could use. I think it was part of a desire to connect with the wild and a recognition of how much people and wolves have in common, I am certainly not the only one to think so. In college I befriended a young man named Z. No I did not make that up. We had some nerdy common interests and hit it off. Turned out he had wolves living in his back yard. His folks ran Wolf Hollow in Ipswich Mass an educational facility to raise awareness of what wolves are really all about. I spent a lot of time there, was around for the raising of some of the puppies, witnessing the death of the alpha male, even living in the house for a few months. Hanging out with the wolves was a dream come true and I learned a great deal. Me and one of the half grown pups. As amazing and wild as they were, these animals, for all the love of the people around them, lived withing artificial confines. So did I. Now about 15 years later I am much less confined, much more connected to the wild. So time to experience freely living wild wolves in their own place. I went out with Alexis to scout for tracks along highway 60 on the morning of our second full day. I found out tracking at 50 mph is a good way to train your mind . 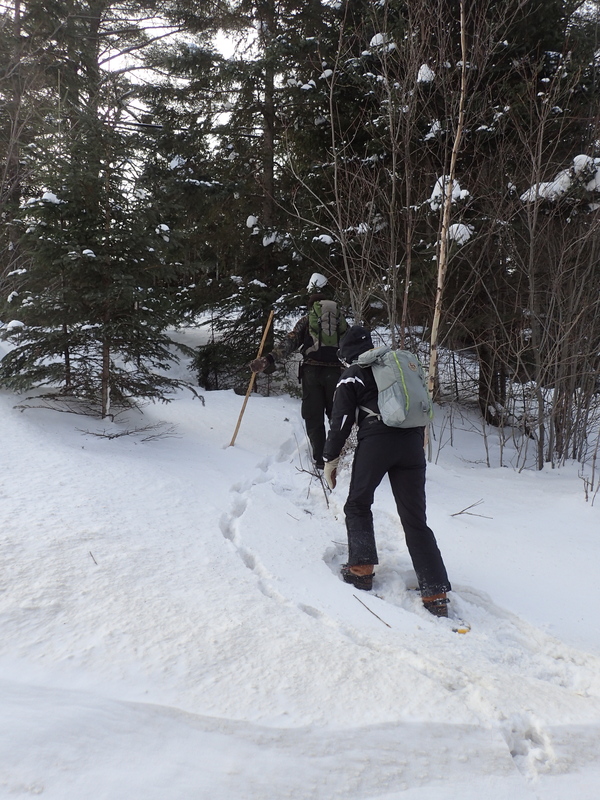 We saw so many fox and moose trails I quickly learned how to recognize them from a distance at a glimpse. 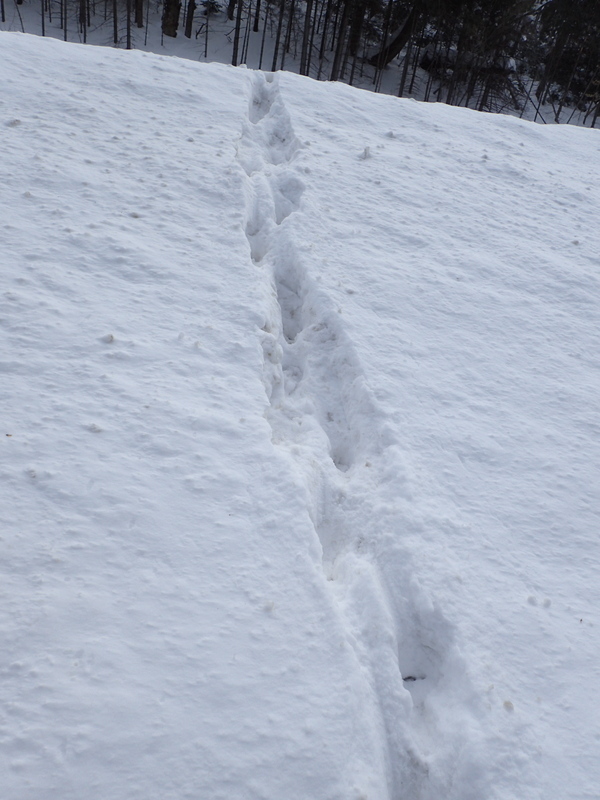 The wolf trails looked quite distinct from the other two as you might imagine. Above and below are the first wolf tracks I have ever seen in real life. For anyone familiar with tracking or wolf feet they might seem quite small. The wolves of Algonquin Park are not the same as the big Grey Wolf Canis lupus. It was known for many years the wolves of the park and surrounding areas of Ontario, Quebec and parts of the nearby States were smaller than their big Northern brethren, and too big to be Coyotes, one of North Americas other three wolf species. Genetic studies in the 90s by Brad White and Paul Wilson of Algonquin Park showed that these local animals were distinct from the big Grey Wolves (Canis lupus) and little Coyotes ( Canis latrans). Turns out they were very much like the Red Wolf (Canis rufus) of the US Southeast, the same species. White and Wilson called it the Eastern Wolf (Canis lycaon even though it is the same species as Canis rufus). It gets even more confusing as sometimes Lycaon and Latrans breed and sometimes Lupus and Lycaon breed. In the park they sometimes have really big wolves and sometimes really small ones. The biologists and naturalists of the area don’t think there are Grey Wolves or Coyotes are currently present in the park (Mammals of Algonquin Park, Strickland and Rutter revised 2002) though they reside in other parts of Ontario. This past and possibly current mixture is referred to as Canis soup. Back to my story. 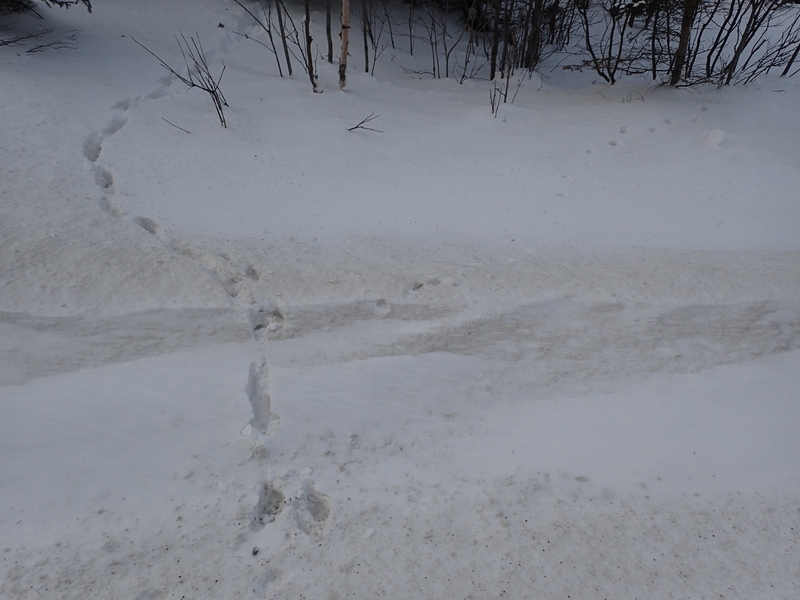 We discovered through the course of the day following each of the 3 or 4 trails along the road, that most likely a single wolf traveled many kilometers on the highway the night before, leaving it for occasional short forays into the woods and back out again. 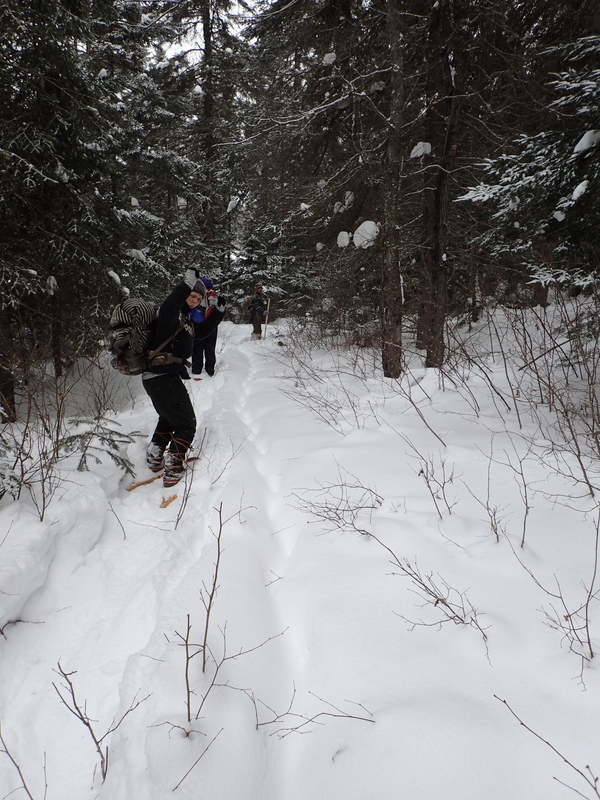 The other half of the group followed one trail to a bed and we followed these trails off and back onto the road. 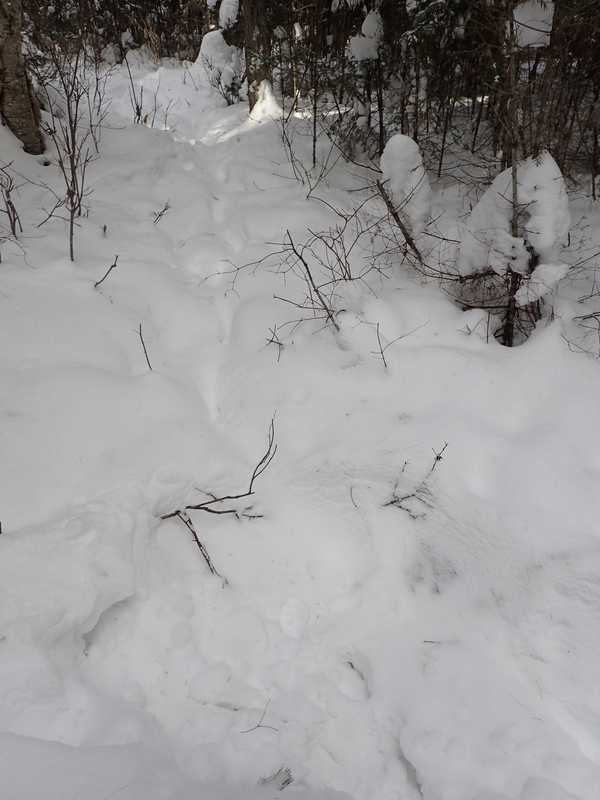 The image above includes a Red Fox trail which appears narrower and neater, moving in a half loop to the right. 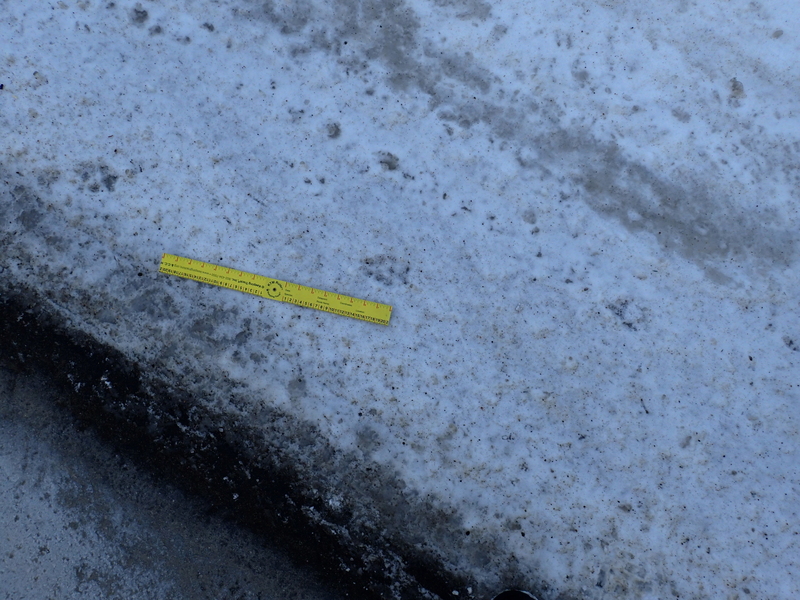 The clearest wolf tracks I saw over the week, again on the side of the highway. We followed this trail in to where it turned around and came right back out. 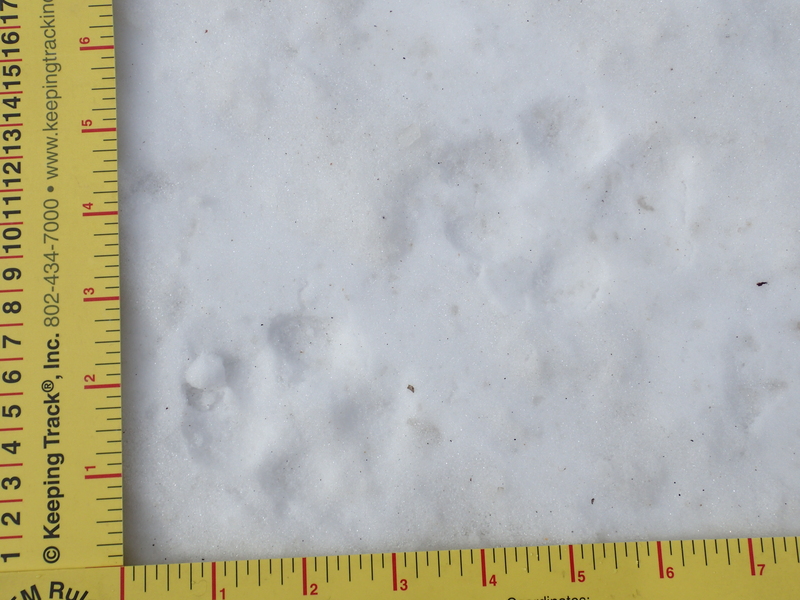 Above is a fox track for comparison. 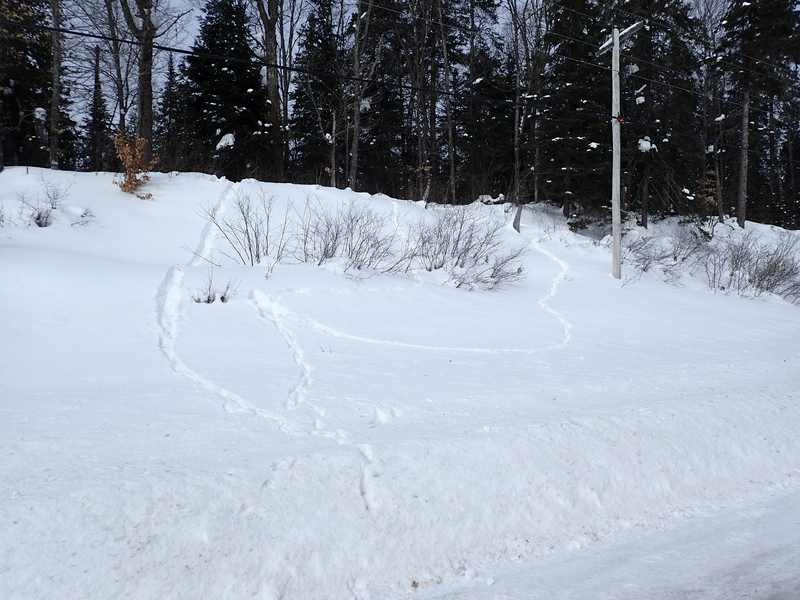 The local Red Fox left the biggest tracks of its kind I have ever seen. The morphology, or shape, is the give away, indistinct in the center because of the very furry nature of Red Fox feet, and a bar shaped metacarpal pad which can be seen on the left side of this photo. Distinctly deep and messy wolf trail. Like moose, their long legs allow easier movement in the deep snow. The next days early morning scout reveled no wolf movement along the highway. 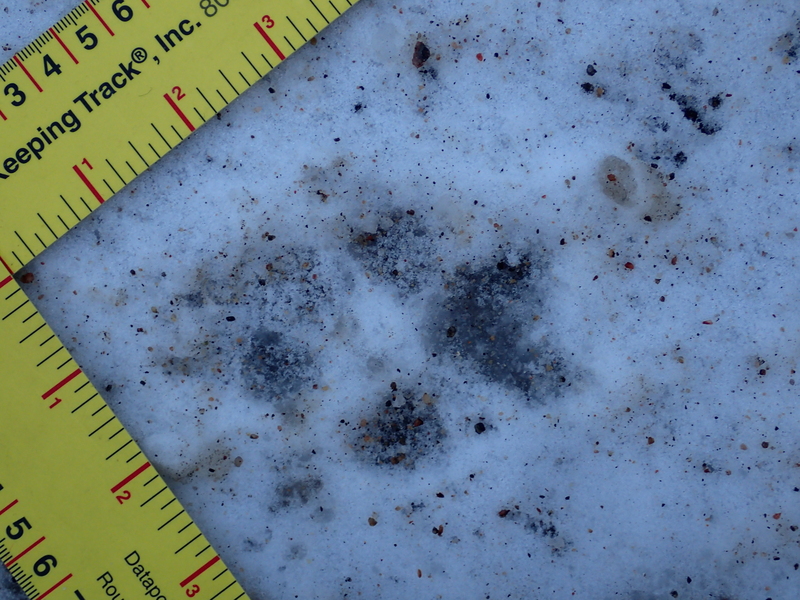 We found wolf tracks anyway on the way to the Chit Lake rangers cabin. 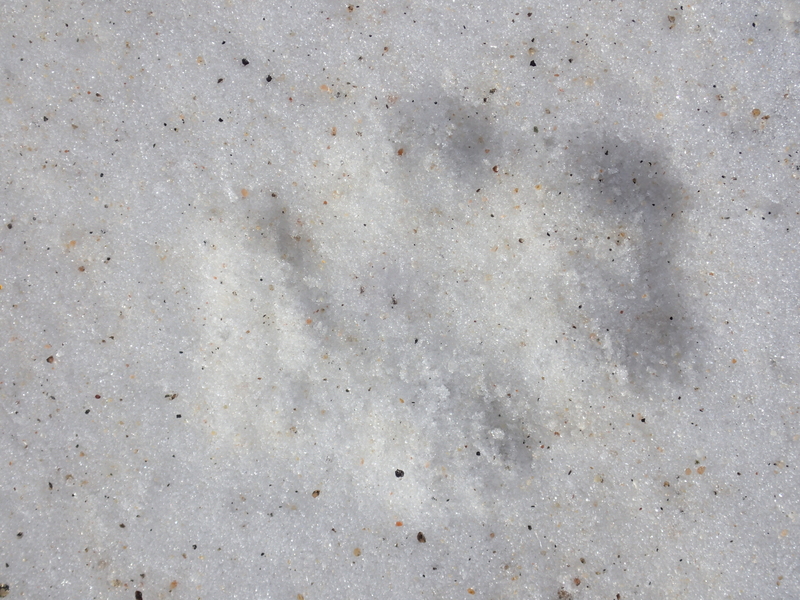 These were older snowed in tracks as seen above with Deneen celebrating their discovery. Wolf urine along the trail. They of course scent mark inside their territories. Where we had to leave the trail I went ahead a little and found a spot where a wolf walked right through a moose bed. 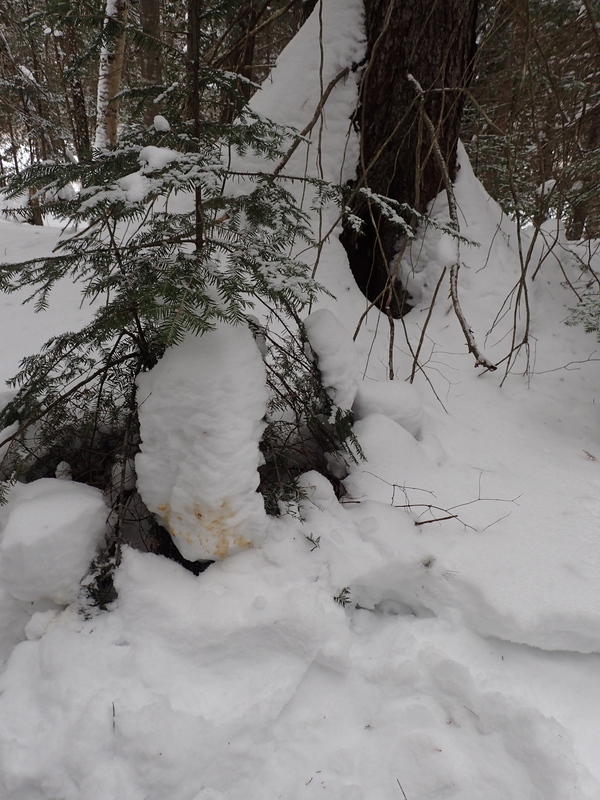 In this area I got a little confused because the wolf tracks were mixed in with big moose tracks. I did not have time to follow it out and confirm a suspicion that there may have been more than one wolf, they will often follow each other stepping in the front wolf’s tracks the way we were breaking trail for one another (Mostly Dan and Alexis bless them). When I got back to Dan I told him my suspicion and he agreed. We dug in the snow to feel the bottom of the tracks which were quite deep with hard packed bottoms suggestive of more than one animal stepping in the same spot. That coupled with the scent marks points at least a little bit toward multiple animals. How lucky am I to have the experiences I have had. 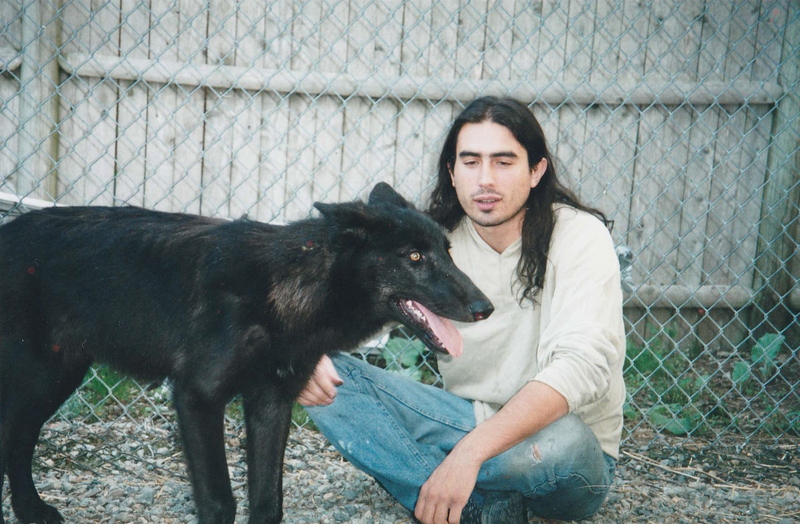 Tracking wolves in the Canadian wilderness, living with wolves outside the window when I was a young man, feeling a little bit of wildness anytime I want just by walking out the door. It doesn’t always take wolves to feel that way, a chickadee in a hemlock will do it. Though it doesn’t hurt.